While I was checking out the work on the splash panels from the wheel arch, I caught a glimpse of daylight at the top of the wing. This turned out to be a tiny hole in a cluster of rust bubbles. 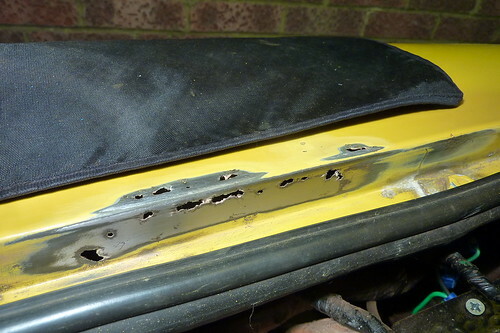 The rust is mainly hidden by the bonnet when closed but a quick run over it with wet & dry showed that the pinhole was not alone. In all around a dozen small holes were revealed, some joining up to form longer cavities. I used some bodywork mesh on the underside to strengthen the fix and give something for the filler to attach to. Over the next week I'll paint this and blend it into the surrounding paint.